As a parent, you must be well aware of the fact that your child first year is a year of tremendous physical growth and development. A child usually grows about 10 inches in his very first year and gains about triple of his birth weight by the same year. And that’s just the beginning – in that very first year of his life the child learns to sit, roll, crawl and creep, even the sleeping pattern of your new born changes over the year. Just after the birth, the newborns have a tendency to sleep a lot – if you look at the statistics, a normal child needs roughly 17-19 hours of total sleep in the early weeks. But as a parent, you must be aware that their sleep is generally very broken. Your newborn generally requires feeding after every 3 – 4 hours of sleeping and most children sleep for a couple of hours or even less than at a time. After your child is about 4-6 weeks old, he needs 15- 16 hours of total sleep a day. But by 9 weeks, many children tend to sleep for shorter time period by the day time and longer at nights. While, these changes in sleeping patterns of the newborn get too troublesome for new parents, they are quite necessary for the newborns. By the time your newly born son gets 4 months old, the sleeping habit of your child will eventually start to get organised, he will start taking longer naps at night while shorter period of sleep during daytime. So, it is suggested that if the baby falls down to his own schedule, make sure you go with it. Sleeping period will become much more visibly clear by this point of time. Now, if your child is about 4 month of age, he might need 4 to 5 naps by the day while 6 months of child require more or less like 2 or 3 naps a day. These naps might not happen at the same fixed hour every day, don’t worry! Many newborns have a tendency to take predictably naps, but others might need few more months. While many babies might grow the tendency of sleeping by night by this point of time, other won’t, don’t lose sleep, it is perfectly normal. Many parents might find their 6 month baby still needs night time milk feeding. Hence, you will find your 6 months old sleeping longer duration at night. By the end of 7 months, your child will inculcate a predictable daytime schedule, although hours might not be fixed. By 7 months, the child needs 1 or 2 naps throughout the day. 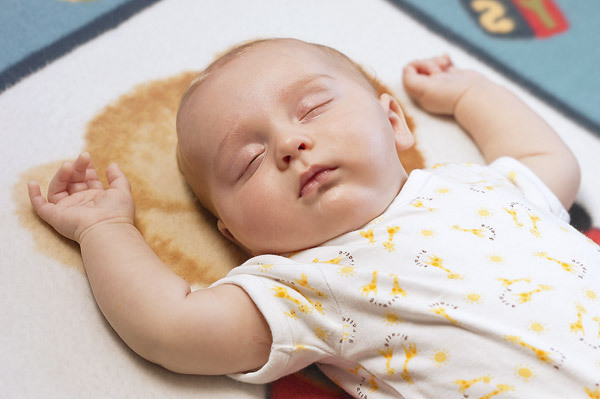 While by 8 months your baby will start following 2 naps a day schedule – one morning nap and other one in afternoon. By this time your child might experience a simple sleep regression, and this sleep regression can truly disturb the sleep. The sleep regression, which your child experience around the end of 8 or 9 month is basically because of all sorts of physical growth of your child around this time — starting to cruise, crawl, drag up and try to stand, and possibly can take his very first steps! All this can be fairly important for a parent, this can serious upset the sleep. At the time your child reaches an age of 10 to 12 months, he might only need feeding during the day time; still there are few children who might require an occasional one time feeding at night. Your baby by the age of 10 months will start taking two naps a day. There is a huge misconception among parents that by the 12 month their baby requires only a single nap a day. It is a fact that many children are not prepared to take a single nap schedule until they are 15 to 19 months of age. Still by this point of his age, if your baby might not have a fully predictable daytime sleeping schedule, make sure you work on it. This can help out to make sure that your child is having sufficient amount of sleep, and that the sleep is completely well organized. Predictable sleeping schedules of your child should consist of a constant bed time sleep. Regular bed times are the main ingredient for a superior daily schedule. While there is no definite way to create a bedtime schedule for your child, yet having a schedule will definitely help your children when your child is a little older.